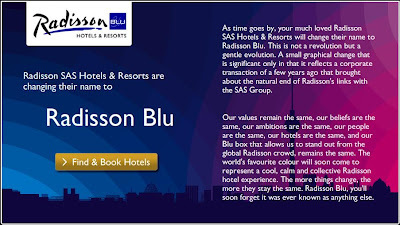 “As time goes by, your much loved Radisson SAS Hotels & Resorts will change their name to Radisson Blu. This is not a revolution but a gentle evolution. A small graphical change that is significant only in that it reflects a corporate transaction of a few years ago that brought about the natural end of Radisson’s links with the SAS Group. If that isn’t clear, Gordon McKinnon vice-president of branding explains: “Our customers are used to a difference between Radisson SAS and simply Radisson and we wanted to keep that differentiation there by using “Blu” in the title, in reference to the previous use of a blue box in the logo.” He also said he hoped the rebrand would win more customers. Let’s suspend reality for a moment and say that that makes sense. OK, why BLU and not BLUE or even BLEU for that European flair? It just looks like someone forgot to type the “e”.